I really enjoyed working with the walnut wood for this project. It smells really nice as you work it with the chisels! This case will protect your iPod against life's bumps and bruises. Let's face it, you like to throw your iPod Nano (4th generation) into your purse, bookbag, briefcase or whatever. Why not protect it in style? And unlike those other cases, your iPod is the same small size when you want to use it -- not wrapped in an inch of plastic. This case will superbly pamper your iPod Nano. The depth and captivating warmness will entice people to reach out and feel it. The rounded edges will provide comfort as it easily fits in your grasp. 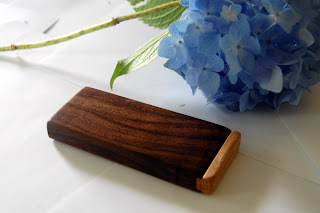 This iPod Nano case made from a single piece of walnut salvaged from the green mountains of Vermont. It features a maple sliding dovetail cover made for the mahogany lid. The lid is hand-worked with chisels for the best fit. The contrasting woods provide balance and harmony. 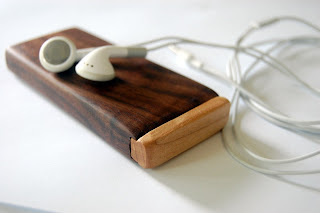 Why not have a unique conversation piece for your iPod that is also extremely practical, durable, and beautiful? Go green by buying brown -- brown wood versus wrapping your iPod in harsh plastic. It has two coats of danish oil and one coat of hand rubbed Carnauba wax for the finish. The grain on this case is spectacular!